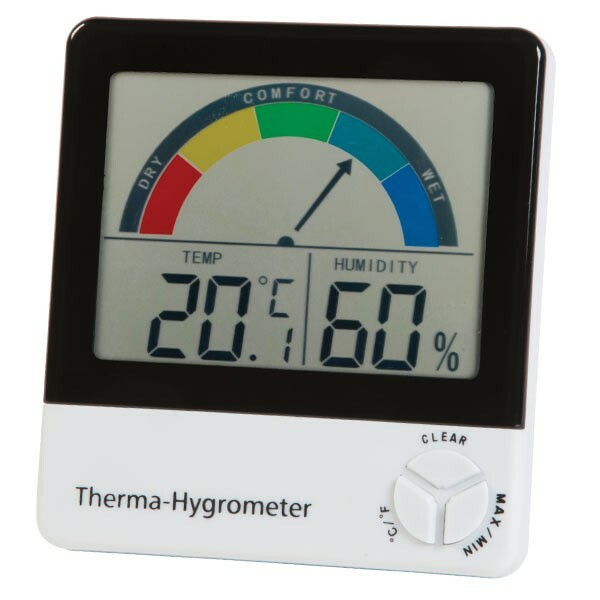 Simultaneously displays both the humidity and temperature in addition to indicating and recording the maximum and minimum readings. It includes colour-coded zones for dry, comfort and wet, making it very easy to read. The instrument measures temperature over the range of 0 to 50 °C and humidity over the range of 10 to 99 %rh. Prompt delivery. Clear and easy to set up. This item was ordered and delivered very quickly at a good price and does the job perfectly. Product exactly what I was expecting. Service very prompt. Would give a 5 star rating if the option was given to use Royal Mail and not a courier. Royal Mail service is far superior for those of us in extreme rural locations. This product works fine and very fast delivery from the suppliers, would use again. The humidity reading on my Thermo-hygrometer reads at 45% humidity having been parked within twenty centimetres of my kitchen Rayburn stove for twelve hours, the temperature being a constant 22 degrees c. I would suggest that this appliance is faulty, and I purchased it particularly for it's humidity readind capabilityu. It works well, is clear and easy to operate. seems to respond quite quickly. The only slight "niggle" is that the base is very narrow so it dose not stand very well (falls over easily). it dose have key hole slots in the back for wall mounting, but if you want to move it about the house this is not practical. Hassle free purchase and would use this company again. Purchased three digital thermometers to put around the office and seem to be quite accurate between them. by retailer. Highly recommend product and seller.